In one of the most beautiful cities in the world, Bujera Fort, a spectacular, newly built fortress, in the Aravali hills, on the west side of Lake Pichola, with views of the City Palace, Lake Palace and the Monsoon Palace and Fateh Garh Castle. Easily accessible, just fifteen minutes drive around Lake Pichola from the City Palace and forty minutes from Udaipur airport. 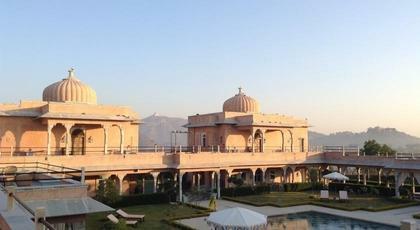 One hours flight from both Delhi and Mumbai and forty minutes from Jaipur.